Posted on Thu, Feb 23, 2012 : 11:27 p.m.
Grass Lake's Sydney Cook, center, has her shot blocked by Manchester's Nichole Jackson as McKenna Erkfritz looks on. The Manchester High School girls basketball team captured a share of its first Cascades Conference championship in school history with a 61-43 win over Grass Lake in front of a home crowd on Thursday night. The Flying Dutch avenged a loss suffered to Grass Lake on Jan. 10, giving both teams identical 12-2 conference records to split the championship. For Erkfritz and her teammates, this was a game they had circled on their calendar. “We were ready for it the day after we lost to them in the first place. I think that time we took preparing really helped out in tonight’s game,” Erkfritz said. Manchester came out of the gate with a 7-2 run and ended the quarter leading 16-8. Defensively the Dutch forced six turnovers in the quarter. But it was the shooting of sisters Taylor and Jessie Manders that helped Manchester build its lead. 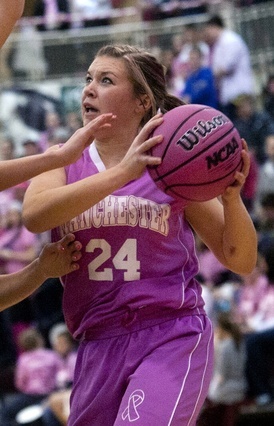 Taylor Manders, above, and her sister Jessie combined to score 28 points on Tuesday. The duo made four 3-pointers in the first half and combined for 18 of the team’s 35 first half points. Jessie Manders, a freshman, finished with a game-high 19 points while pulling down seven rebounds. Taylor Manders had nine points. Coach Cori Kastel wasn’t surprised that Jessie Manders and fellow freshman Maddie Collins (eight points) were up to the challenge of performing in such a big game. Trailing by 15 with a little less than three minutes left in the half, Grass Lake got three consecutive 3-pointers from Sydney Rubingh and Clara Waidley to build some momentum before the half. Manchester would hold a 35-24 lead at the break. Early in the second half, Grass Lake trimmed the lead to nine, but it would be the closest the Warriors would get. 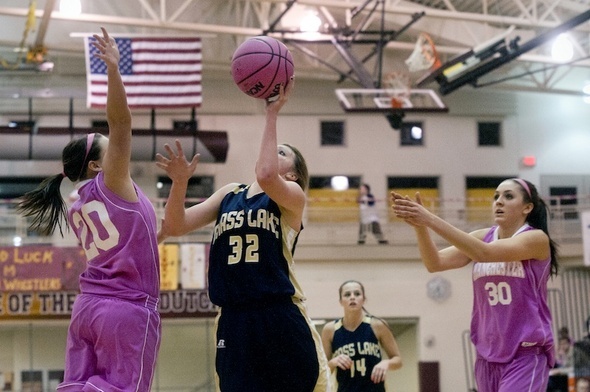 Kellyn Herendeen and Sydney Cook led Grass Lake with nine points each on the night. Erkfritz, who spent most of the first half on the bench with foul trouble would score six consecutive points for Manchester and help restore the lead to 16 points after three quarters 50-34. Erkfritz finished with 11 points and nine rebounds. With one of their goals accomplished, Kastel and her team now turn their focus on districts Monday where they face Clinton at 8 p.m. at Willow Run High School. Kastel said she thinks her team will be a force in the state tournament.